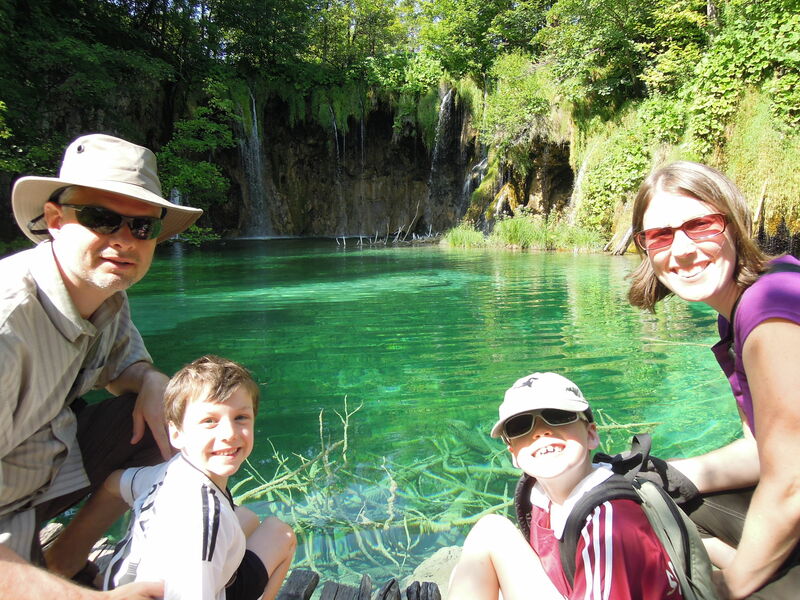 I bar ely slept last night because I was so worried that we would oversleep and miss our opportunity to beat the crowds in Plitvice, one of the world’s most beautiful natural places. Officially, it is located in central Croatia (right near the Bosnian border), but it simply wouldn’t be fair to call it purely a Croatian paradise. It is a Unesco World Heritage Site and so full of extraordinary beauty that it doesn’t seem possible. We didn’t oversleep. I woke up every hour on the hour until 6:00 am, when I deemed it reasonable to wake the household. I spent our 5 hour Plitvice visit patting myself on the back for this action. There were times when we had the trail to ourselves, pausing when we wanted to, and keeping our own comfortable pace. Quentin only complained once during the entire trip and it was at the end when he was getting hungry. The only trouble I had was taking too many photos. Sometimes you just need to drink in the scenery and skip the photos. I’m happy with a couple of good ones I took of the boys as they watched fish and Stephen took a great video of a little water snake that Quentin discovered. A final word to everyone: you just hafta go. Before our day at Plitvice, we travelled through Bosnia to the border, taking our time and making a couple of short stops in Travnik and Jajce. I got tired of seeing battle damaged buildings in every little town. Bosnian towns have a mix of Balkan people’s, sometimes Serb/Muslim, sometimes Croat/Muslim. There are others as well, but they don’t count in any official way. Anyway, these people fought each other bitterly in every region and every small village. The war is now over, but the truce is complicated. Every region in Bosnia affiliates itself (officially or unofficially) with one of the three major national groups and yet every region is still mixed in its actual population. It is a weird and unstable situation. I hope to go back to Bosnia-and especially Sarajevo-again in my life. It is a beautiful country, but a tired one. I hope they can resolve their political tensions without fighting and hardship. Recovery from the last war has been a long, hard road and they are still not there yet. We are now all set up in our Rovinj apartment and look forward to swimming, finally! Goodnight everyone!